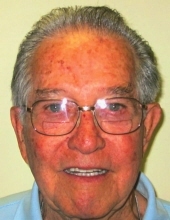 Peoria-Harold Gerrard Connor, age 90, passed away at 8:00 AM on Tuesday, February 5, 2019 at Christian Buehler Home in Peoria, IL. Harold married Maurine James on September 16, 1950 in Paris, IL. She preceded him in death on October 12, 2017 in Peoria. He was drafted in the US Army in 1950 and served 21 months during the Korean War. Harold attended Basic training at Camp Cook in California, went overseas in 1951 serving with occupying forces in Japan for 6 months and 3 months in Korea. He served his last 3 months in Colorado Springs, CO at Camp Carson. Friends may sign the online guestbook or send private condolences by logging onto www.wrightandsalmon.com. To send flowers or a remembrance gift to the family of Harold G. Connor, please visit our Tribute Store. "Email Address" would like to share the life celebration of Harold G. Connor. Click on the "link" to go to share a favorite memory or leave a condolence message for the family.